While NetSuite empowers organizations with better decision making capability, business can get vital real-time information only when NetSuite records are updated with complete and accurate company data. G Suite – NetSuite integration enables business to upload files and folders directly from Google Drive to NetSuite records, reducing manual workflows. Inspirria Cloud Connect helps businesses drive cloud to cloud synchronization of - Gmail, Google Calendar, Google Drive, and Google Contact - within NetSuite. The outcome: increased user productivity, accelerated business processes and improved visibility - all through a single sign-on. Access to up-to-date customer information leads to exceptional customer experience. Inspirria Cloud Connect works in the backend, enabling two-way synchronization between NetSuite and Google Contacts. This means when contacts are updated/created/deleted in Google Contacts, they are automatically updated in NetSuite as well. This helps reduce import and export of contact details and enables users to access data wherever they want. In addition, Inspirria Cloud Connect help organize contacts in multiple fields such as name, email, contact no and designation. Inspirria Cloud Connect makes it easy to bi-directionally synchronize Google Calendar - NetSuite Events, saving time. This way, event creation, updation or deletion gets updated in Google Calendar and NetSuite simultaneously. As a result, organizations can easily get alerts on upcoming events and highlight events in progress to ensure follow up. Inspirria Cloud Connect allows Gmail integration with NetSuite. This ensures creation and attachment of Gmail messages to customer, contact, and opportunity records in NetSuite, resulting in deep contextual customer information for delivering personalized experiences. 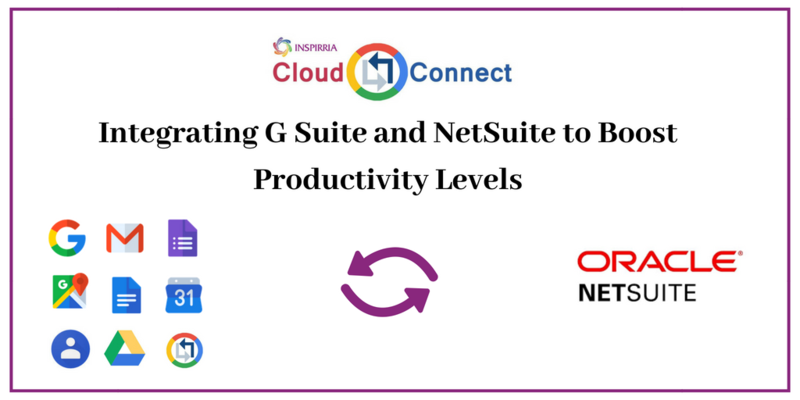 Cloud Connect also enables easy login to NetSuite using G Suite IDP such as SSO. Contact, customer, lead and opportunity creation, search and edit capability - from within Gmail - further enhances productivity and sales. In addition, the tool also allows team members to view, search, edit and access NetSuite records directly from their Gmail Interface. Succeeding in today’s competitive environment requires accelerated business processes and improved visibility. Inspirria’s Cloud Connect provides access to customer information, documents and email in a web browser (without the need for back-ups), ensuring that everyone is aligned with the latest information for improved outcomes. Inspirria is a leading NetSuite and G Suite for Business partner offering end-to-end implementation services. We leverage more than 14 years of experience and data-driven strategic cloud assessment capabilities to help companies integrate G Suite and NetSuite, driving superior business productivity. Contact our experts for more details or mail to sales [ at ] inspirria [ dot ]com.